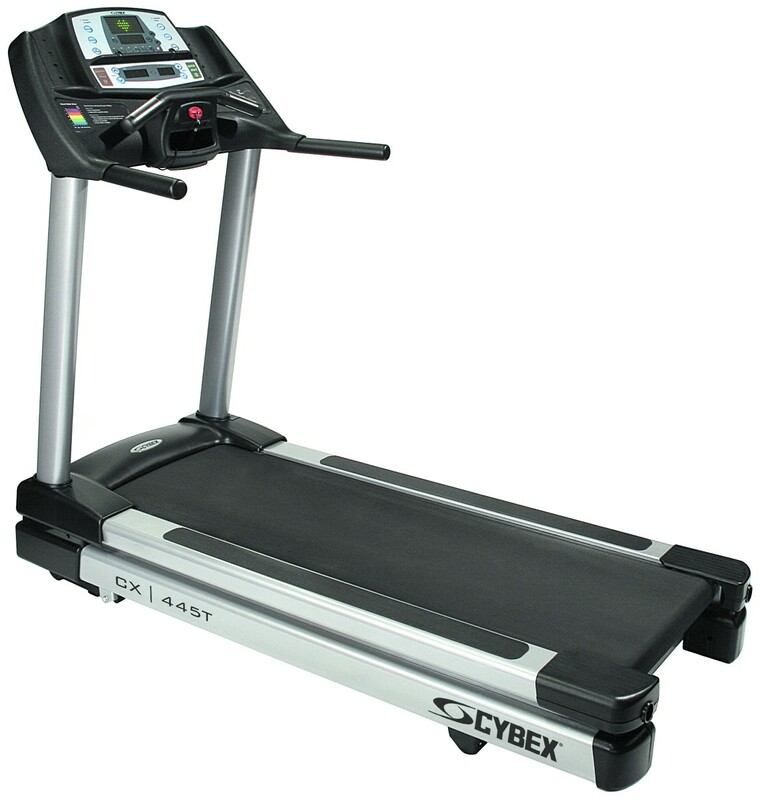 The CX-445T is a full blown commercial treadmill that won't blow your budget or your floor plan. This tread has an ingenious design that provides a wide open running area in an exceptionally small footprint. Just looking at the solid steel dual level design makes a statement that this is a treadmill built for durability. Here's a value conscious treadmill that offers one of the most innovative deck designs ever conceived. The CYBEX CX-445T is a treadmill where the runner's foot doesn't hit the front hood, and the Intelligent Suspension deck gives stability to the stride without jarring the back. Ever vigilant about safety, CYBEX provides the safety sentry feature to monitor for unattended treadmill operations. The CX-445T treadmill also offers a multi-colored feedback of heart rate. CYBEX brings science to the art of running and makes it available in a treadmill that is compact and budget-conscious. COMPACT COMMERCIAL The CX-445T is a full blown commercial treadmill that won't blow your budget or your floor plan. This tread has an ingenious design that provides a wide open running area in an exceptionally small footprint. Just looking at the solid steel dual level design makes a statement that this is a treadmill built for durability. Here's a value conscious treadmill that offers one of the most innovative deck designs ever conceived. The CYBEX CX-445T is a treadmill where the runner's foot doesn't hit the front hood, and the Intelligent Suspension deck gives stability to the stride without jarring the back. Ever vigilant about safety, CYBEX provides the safety sentry feature to monitor for unattended treadmill operations. The CX-445T treadmill also offers a multi-colored feedback of heart rate. CYBEX brings science to the art of running and makes it available in a treadmill that is compact and budget-conscious.